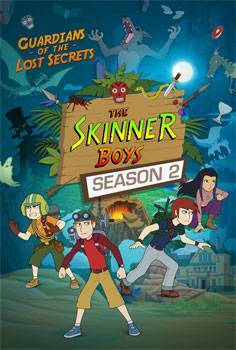 The Skinner Boys Season 2 – Guardians of the Lost Secrets will be coming soon to Saturdays and Sundays during Kids' WB on 9GO! The comedy adventure series for 8-12year olds from Australia's SLR Productions is an original concept by Australian Artist, Steve Lyons and will air during Kids' WB on 9GO! every Saturday and Sunday at 7.30am from Saturday 6 May 2017. It's Skinner time! World explorer Augustus Skinner left his 4 grandkids a big surprise... the Skinner kids are now Guardians of the Lost Secrets... a collection of artefacts across the world that possess freaky powers, and crazy creatures that nobody ever believed really existed. As international adventurers, artefact hunters and secret guardians - these teens must live their lives protecting The Lost Secrets against those who would corrupt their powers and endanger the planet. This is the flipped-out, fun and freakish world of the Skinners. And it all results in loads of freestyle missions, teenage antics and offbeat fun. Being teens, these kids have a secret weapon - their youth! Nobody would ever guess that four kids would be capable of outsmarting the powerful Shadowy League and protecting the world. With 52 missions behind them these guardians are up for anything! The series has been produced by broadcast partners Nine Network Australia and SUPER RTL, along with partner Telegael and international distributor, ZDF Enterprises. SLR Productions is one of Australia's leading Emmy and multi award winning children's entertainment companies, specialising in the creative development and production of world-class media content. SLR Productions is the production company behind brands such as the internationally acclaimed preschool property Guess How Much I Love You – The Adventures of Little Nutbrown Hare; the animated twin detective series Lexi & Lottie: Trusty Twin Detectives, the animated adventure series The Skinner Boys – Guardians of the Lost Secrets, the award winning adapted UK picture book Captain Flinn and The Pirate Dinosaurs, the drama series Sam Fox: Extreme Adventures, and the Emmy Award winning animated series I Got a Rocket™. SLR's passion is to make creative, adventurous, imaginative and exciting programmes for audiences worldwide. Established in 2002 by CEO, Suzanne Ryan, SLR Productions has produced more than 160 hours of content sold in more than 100 countries. With its highly experienced development and production divisions, SLR partners with major broadcasters, producers, distributors, publishers and creative both locally and internationally to create hit shows with a truly global reach.